Water "spilling" from an outlet tube in Grand Coulee Dam allows dam operators to control the amount of water building up in Lake Roosevelt. As local areas brace for flooding, Lake Roosevelt is a buffer for communities downstream. Even so, Portland is showing a few signs of minor flooding along its swanky waterfront area, where high water is lapping at sidewalks. After a long, cool period this spring that didn’t let snowpack melt gradually, warm weather and rain may now combine to make that happen quickly. “Some of these cities are going to be really hurting this year,” Scott Miller told the Coulee Dam Town Council last week. Miller, the emergency coordinator for Okanogan County, said most other towns in the county are preparing for floods in the next few weeks, owing to a snowpack in the mountains about double what it was last year. Preparing for the runoff, the U.S. Bureau of Reclamation has held Lake Roosevelt at near-record lows some 72 feet below its highest possible level. The lake level was at 1,223.8 feet above sea level Tuesday night, having risen almost two feet during the day. The river was flowing at 183,300 cubic feet per second, much of that being used to make electricity. That may seem obvious to anyone somewhat familiar with hydropower, but not in an age where political demands lead to the forced inclusion of less efficient wind power. High seasonal river flows and hydroelectric generation led the Bonneville Power Administration to issue an interim decision last week to address a potentially imminent need to temporarily limit output from non-hydropower resources early this week, the agency announced in a press release. The decision will allow BPA to safeguard protected fish and assure reliable energy delivery without shifting extra costs to BPA electric customers. The agency came out with an interim “Environmental Redispatch” policy to help cope with the largest runoff, at least for the Columbia Basin, since 1999. It allows BPA to put limits on generation at coal, natural gas and other thermal plants and could limit wind energy generation. The following was issued by Lynne Brougher, USBR public affairs officer, late Friday. Good info, and the graph says a lot. Current Lake Level — Updated May 20, 2011The level of Lake Roosevelt was 1225.82 at 12:30 p.m. on May 20.Currently, the lake will continue to rise at approximately 1-2 feet per day through the weekend. Conditions are changing rapidly which will influence the rate of rise next week. Updates will occur as information changes next week. Inflows into Lake Roosevelt have ranged from 160,000 – 180,000 cfs. Water is being passed downstream to maintain flows in the 460,000 – 465,000 cfs range at the Dalles. 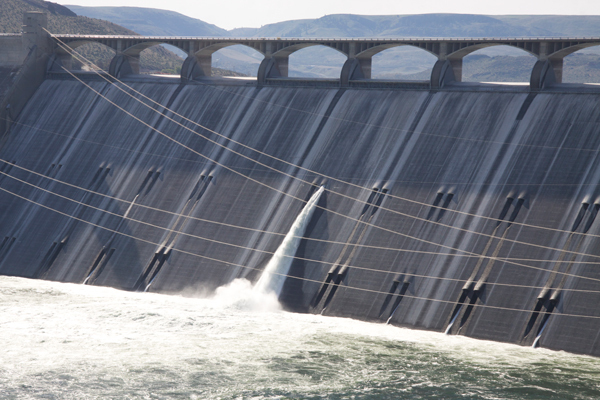 This requires spill from the outlet tubes at Grand Coulee Dam, as it is not possible to pass all the water through the generators at this time. Spill from the Grand Coulee Dam outlet tubes will reach approximately 42,000 cfs today. Please note that the previous year’s lake level is only shown for comparison. The previous year’s lake level has no effect on the current year forecasts and predictions. This entry was posted in Latest News, Local culture, Patterns and Connections and tagged coulee dam, grand coulee, hydropower, lake level, Lake Roosevelt. Bookmark the permalink.